He found me, alone in this spot, sleeping on the ground under the stars with a borrowed blanket, the hum of palm fronds and birds settling in for the night. I was alarmed at first, but welcomed him as he hesitantly approached. Delighted… a companion and protector for the night. What more could I ask for. We snuggled against the growing cold and slept. The following day, I drove to the coast hoping to see the migrating whales and left him behind, not knowing if we would meet again. A pair of grey whales, mother (cow) and calf approached the boat to check it out. As I leaned over the water for a better look, the cow surfaced and spouted air and water directly into my face… dripping wet in a whale´s breath. What greater gifts are there? 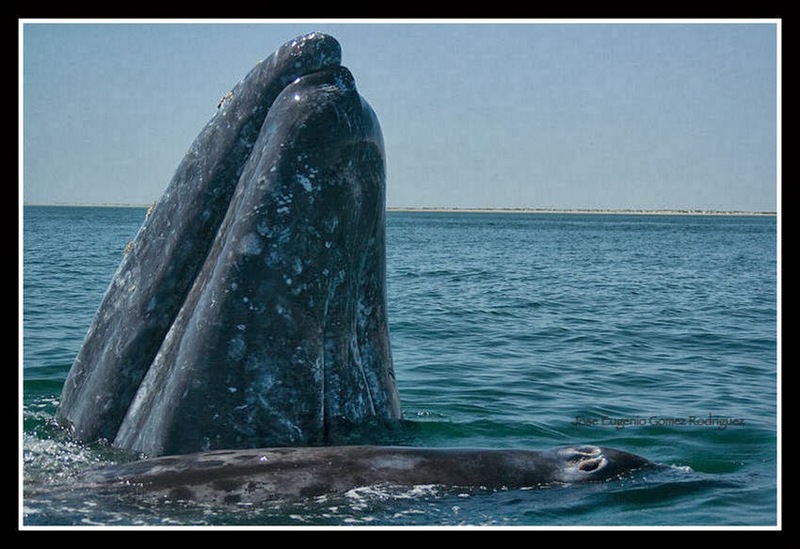 while caressing a grey whale calf as she surfaced time and time again to be touched and stroked. Over and over she nestled herself next to the boat, positioning herself beneath my outstretched hands. Stroking, laughing, crying, looking into each other’s eyes. Fantastic. Unspeakable. The universal desire to touch, connect, across species, across time. After a while, the cow, always close, returned and stayed for perhaps 60 seconds above water, a lifetime of a moment... stroking, holding, touching a barnacled grey of about 45 feet, massive, massive body, absolutely unbelievable mass, gently surfacing for my touch. How? I return to my camp a different person. Physical touch… this dog lying on my cold, wet feet, sharing in the comfort and warmth. Total strangers speaking the same language. I am never alone, never without regal gifts, whether the sound of water lapping with the breeze, the coots running along the water, sand between my toes, the touch of a magnificent grey whale, or simply this dog at my feet.